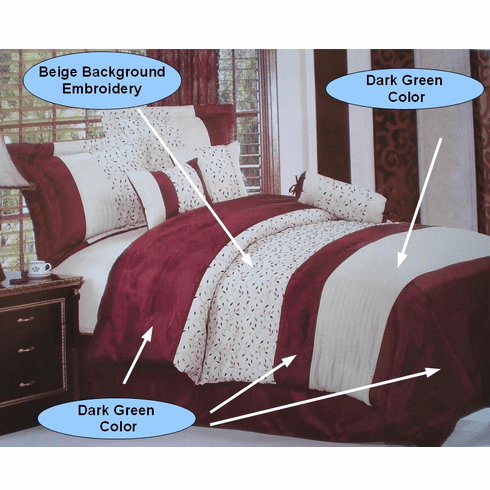 The package includes 7 Piece designer Style Comforter Set bedding in a bag. Reinvent your bedroom with this refreshingly vivid pattern. The designer style modern comforter set will infuse fashionable ambiance to your room and its elegant feel would provide blissful comfort and sweet dreams. 1 Queen comforter 86x86" . 2 Queen or standard shams 20x28"+2.5" . 1 Neck roll / bolster 6.5x16" . 1 King comforter 101x92" . 2 Standard shams 20x28"+2.5" . The colors may vary because of computer monitors. Notes: Color may vary from monitor to monitor. THIS COMFORTER COMES WITH MULTIPLE COLORS. PLEASE PICK YOUR PREFERRED COLOR. Please also see the matching window curtains.